It’s la guerra de hormigas, the war of the ants. For several years now I’ve tried to grow lime, avocado and fig trees, and Bougainvillea with varying success. Mostly, not. The chapulines (grasshoppers) love these plants, too. Both the ants and the grasshoppers consume large quantities of beautiful leafy green. The local antidote is to tie a plastic bag tightly around the trunk of the tree or bush to keep the ants from invading and then pray. Since chapulines fly, we just wait for the season to pass, water regularly and hope the plant will not die. That’s why I’m starting a cactus garden. 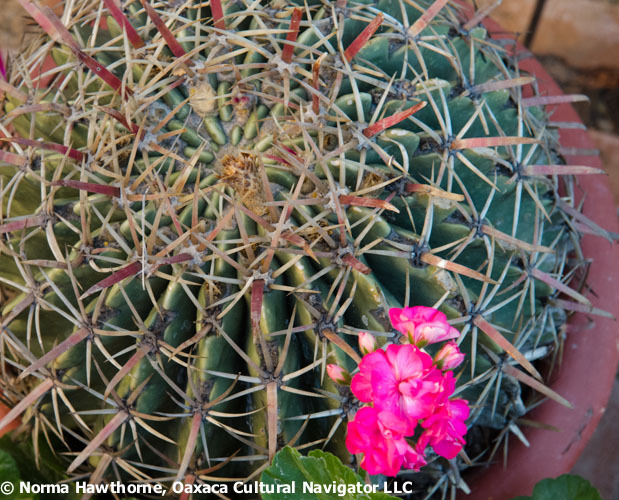 No one likes those prickly, spiny barbs that protect the cactus from predators. 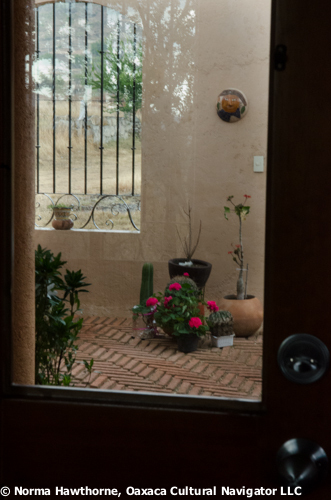 That’s why I asked friends if they would like to bring cactus starts from their own plants as a housewarming birthday gift to help me get my cactus garden going. 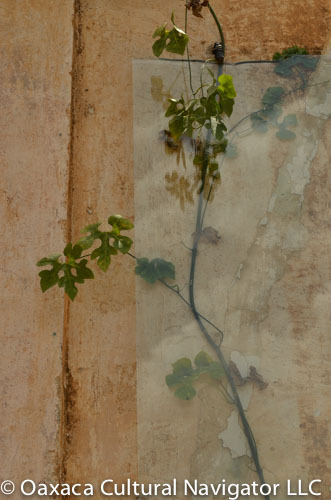 That’s why I especially asked Josefina to bring me a cutting of her big, beautiful geraniums whose leaves are so pungent that anything that crawls keeps its distance. 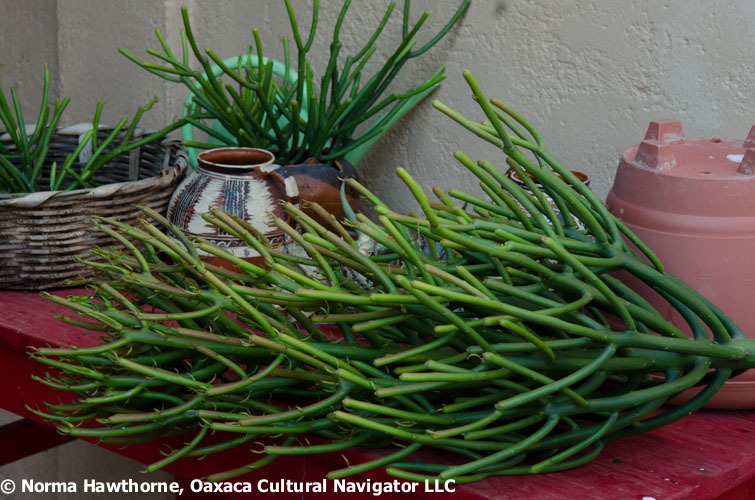 Some of these cactus are becoming very rare, like the beautiful bulbous Biznaga and the tall, graceful Gar Bii Dauu (a Zapotec word for this rare cactus from the Central Valley of Oaxaca). Others are found in the countryside growing wild and can be easily transplanted. Just break off a spear and stick it in the ground. Cactus know where they belong. 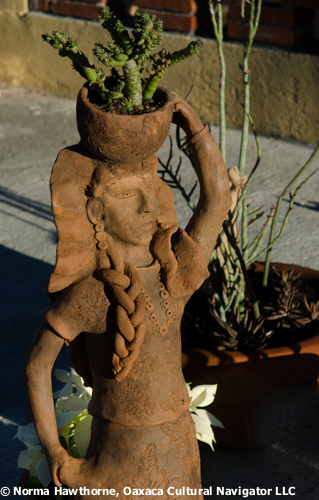 Here in the dry earth of Oaxaca. Yesterday morning after planting the starts into pots a huge, gunpowder grey cloud rose up over the mountains from the east. By mid-afternoon a huge rain descended upon us and gave these new starts a proper watering. For now, the war is over and I win. 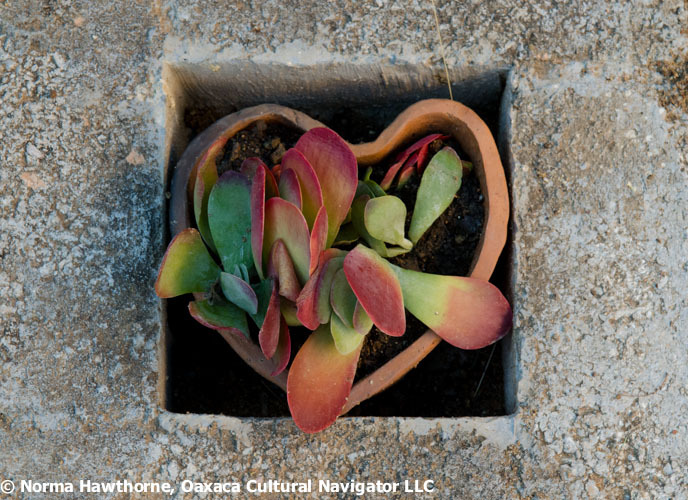 Thanks for the succulent succulents, for joining me in celebration, and for making my gardening life easier: Soledad, Ernestina, Lupita, Tom, Jo Ann, Lupe, Daniel, Josefina, Magdalena, Rosario, Janet, Jan, Annie, Roberta, Lynda, Stephanie, Rafaela, Mariano, Luvia, Samuel, Fe y Lola, Omar Cha San, Janetita, Lori, Shannon, and Martha. 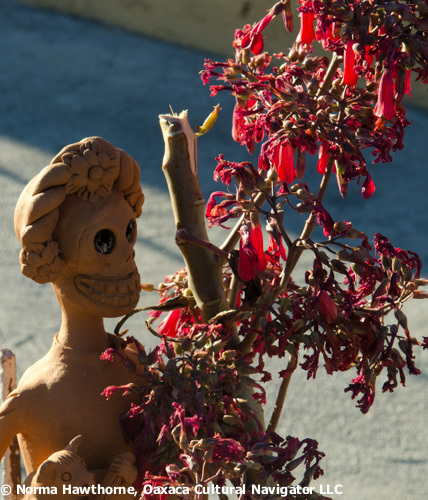 Matria Jardin Arterapeutico is the manifestation of artist Maurico Cervantes’ imagination. 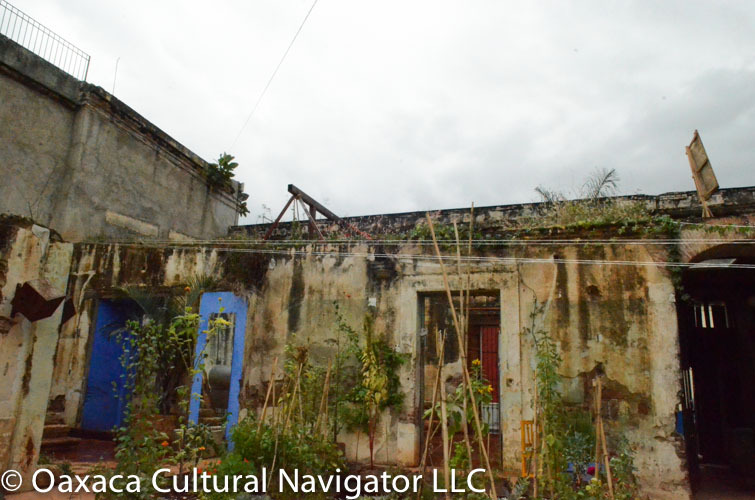 With the help of many, many others plus foundation funding, a decayed, roofless 17th century colonial building in Oaxaca’s historic center has become a cultural mecca. 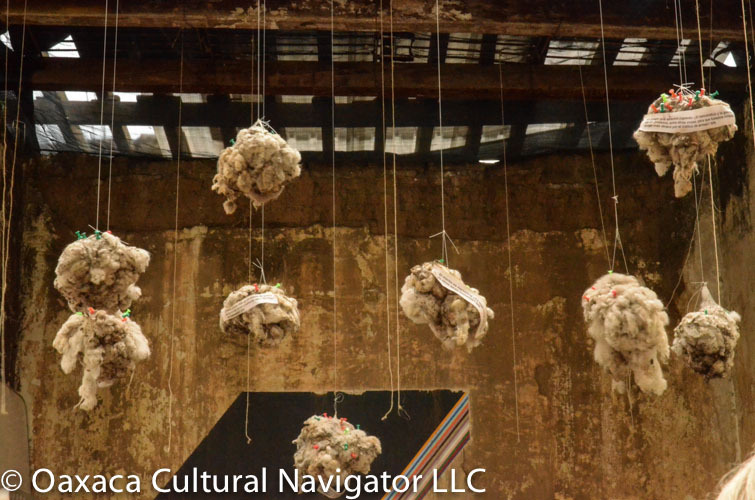 It is at once a moveable art installation, organic garden, educational teaching center, music and arts venue, and inspiration for innovation — a fine example of what to do with aging space with great bones. 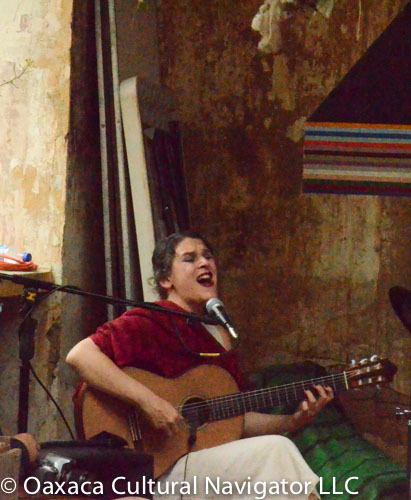 Despite a late Sunday afternoon rainstorm (much needed, I might say), Matria hosts Sandmann and The Voodoo Cat, a three-person cabaret-style ensemble for our listening pleasure. 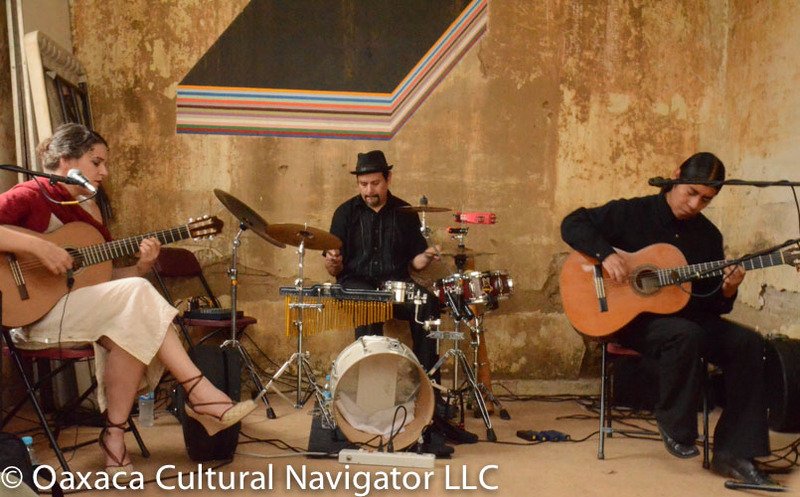 Tucked inside the only area with shelter from the sky, Kati Sandmann (vocals, guitar), Dabeat Morales (percussion), and Ricardo Chavez (guitar) perform as if the 40 of us is a sold-out audience of hundreds at Carnegie Hall. 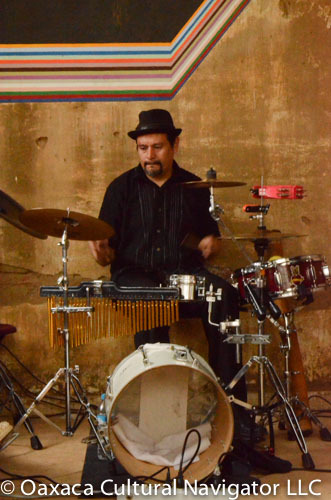 Their range goes from blues to folk to swing to rock with a hint of jazz. Kati’s voice sounds like Edith Piaf or Lotte Lenya, extending from alto to alto soprano. She sings multi-lingual in German, French, Spanish and English. It is at times atonal, dissonant and altogether appealing. I hear Kurt Weill and Berthold Brecht, Bob Dylan, Jacques Brel, Johnny Cash, Leonard Cohen, and Ray Charles. Not too long into the concert the skies opened and out came the umbrellas. The band played on — unflappable. 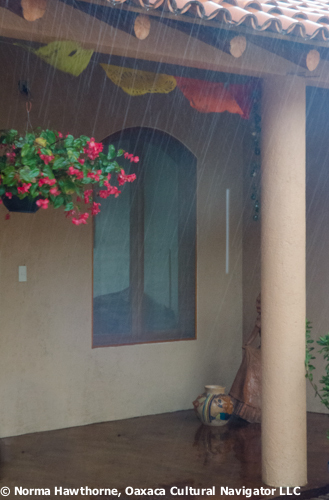 We stayed, enraptured with the sound, and the rain coming through the porous roof. At this moment, church bells sound calling people to Sunday evening mass. The bells blend perfectly with the music. Two standing ovations brought two more songs before the concert ended. 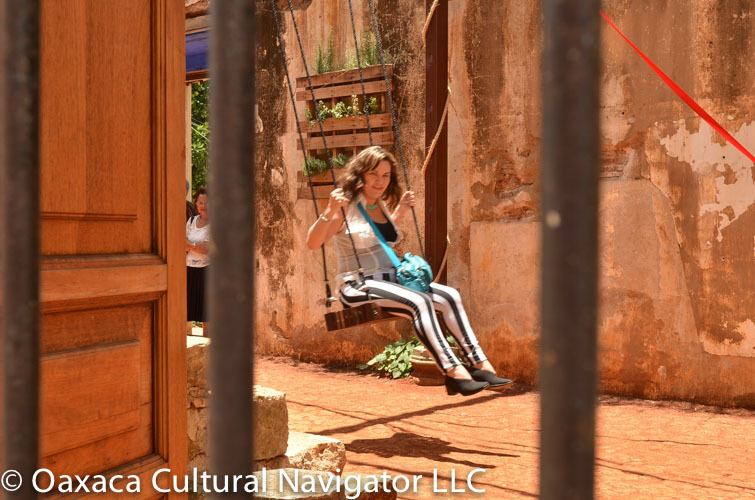 When in Oaxaca during the summer, the best advice is to carry a paragua when going out. The concert ended. The skies cleared. 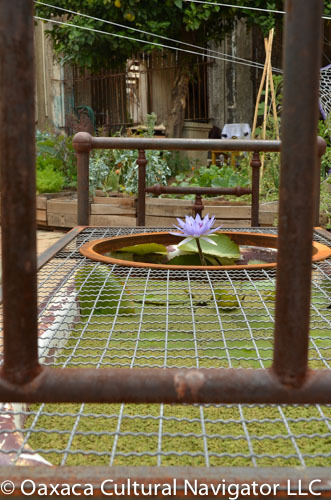 I returned to the courtyard, rain reflected on organic food, in mirrors, in the bathtub lily pond encased in an old bed frame. 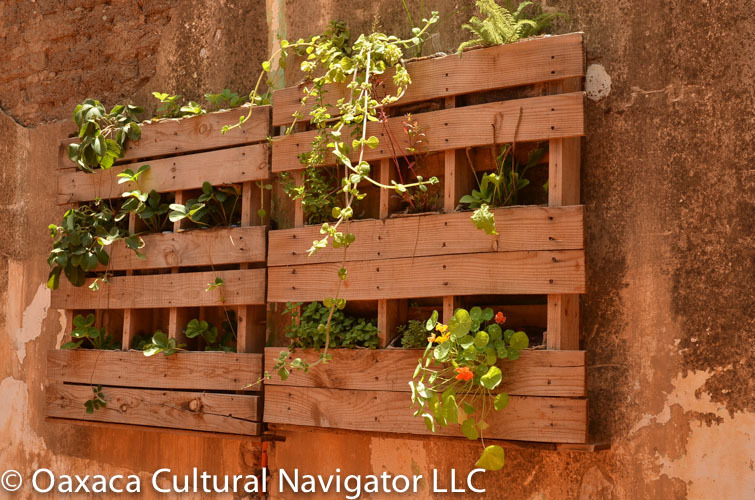 Lots of ideas here for gardening and imagining and meditating. Matria Jardin Arteterapeutico, Murguia #103, between Macedonio Alcala and 5 de Mayo. Check out their Facebook page for upcoming events. 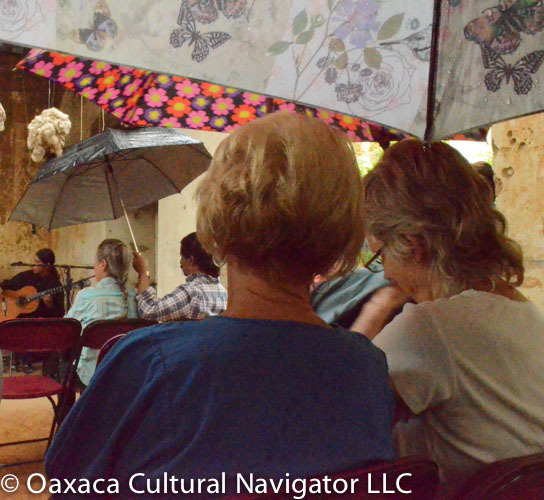 History converges in Oaxaca, Mexico because her indigenous people have survived for millenia despite conquest, wars, disease, poverty and malnutrition. The archeological ruins of Monte Alban and Mitla are evidence through extraordinary physical remains of the building and destruction of great civilizations. Descendants live in the valleys below with language, culture and art intact. 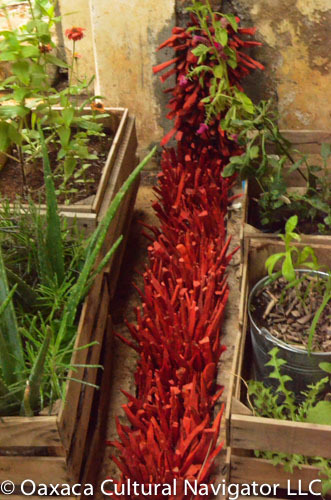 Her food — mole, squash, corn, beans, chiles — are also a living testimony to creativity and adaptation in a harsh land. 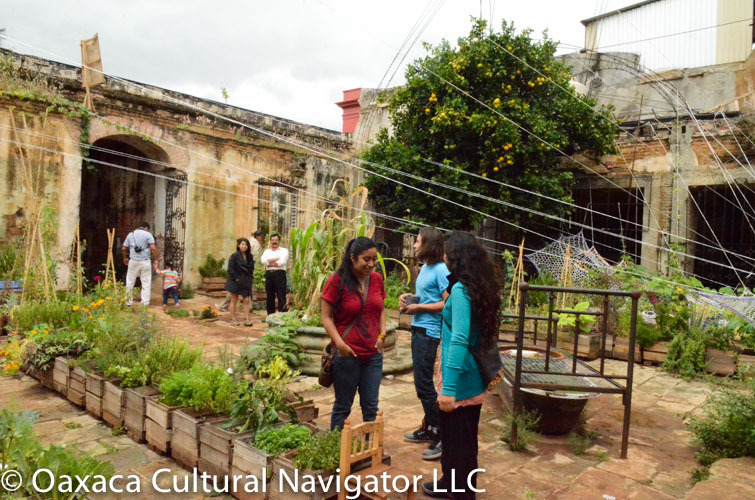 Rothstein uses a good part of his “column inches” to discuss the importance and impact of the Ethnobotanical Gardens designed and developed by Alejandro de Avila B. 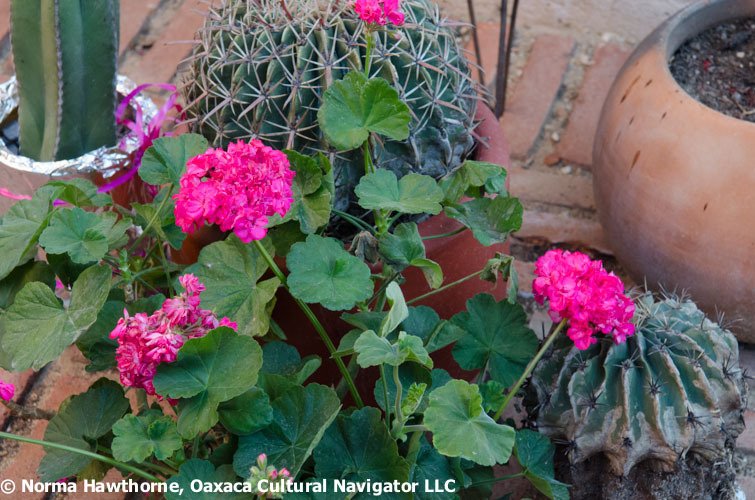 It is a living centerpiece of Oaxaca’s cultural history — a compendium of native plants that people have and continue to depend on for fiber, natural color, shelter, and beauty. 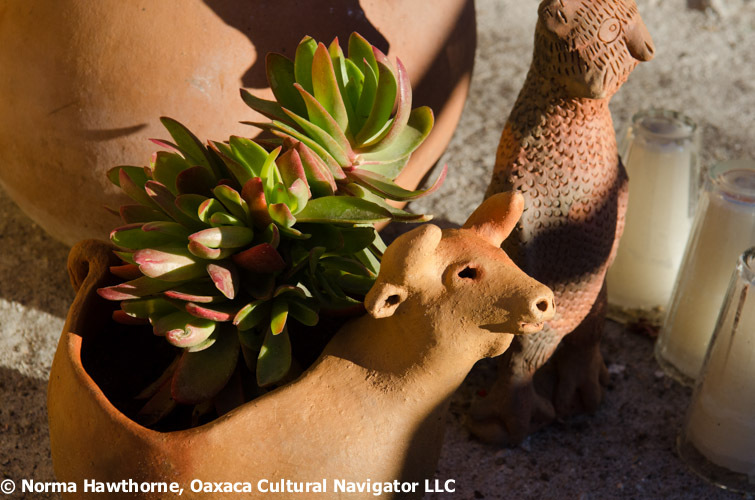 Oaxaca is rich in tradition that has not died out and is only accessible through memory and museum exhibitions. I think of the Taos pueblo, the Four Corners in Utah, Arizona, Nevada and Colorado, the dioramas and exhibitions in the Museum of the American Indian, annual Indiana pow-wows of the Potawatomi to bring far-flung tribal members together, and the painful history of exile, annihilation and reservations. What do you think of when you read Rothstein’s article? And, yes, Oaxaca is safe. I am on an airplane today to Mexico City, then Puebla. I’ll pick back up on my posts in a few days. Plus, thanks to friend Leslie Fiske Larson for bringing this NY Times article to my attention! 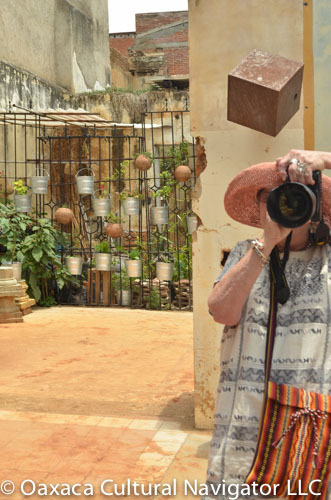 Leslie spent several months volunteering at the Museo Textil de Oaxaca and knows a great pushcart fruit stand right around the corner! Yummy papaya. 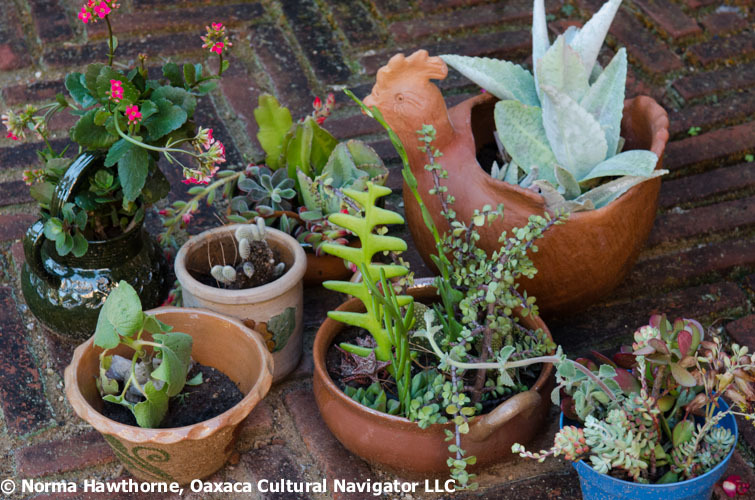 Rather than give you another review of Oaxaca’s Ethnobotanical Garden, I thought I would share this excellent article recently published in Garden Design Magazine. It has lots of photos of this remarkable space. Thanks to Mary Ann Walsh who follows this blog and shared the link with me. Check the Garden for availability of guided tours in English, usually available Tuesdays, Thursdays and Saturdays at 11 a.m. You can only enter the garden as part of a guided visit which lasts two hours. 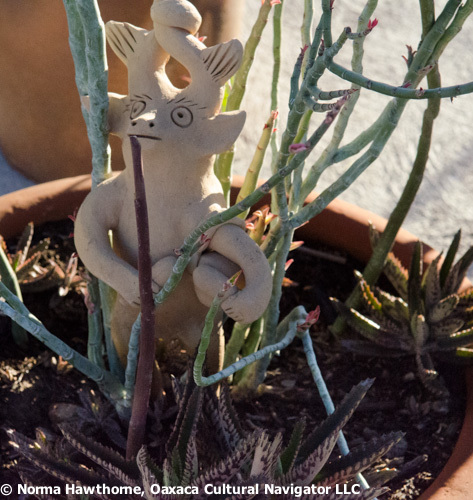 You can see some of the same design elements in this garden that recur in some of the more recent renovations — the Museo Textil de Oaxaca and the Centro Academico y Cultural San Pablo funded by the Alfredo Harp Helu Foundation. 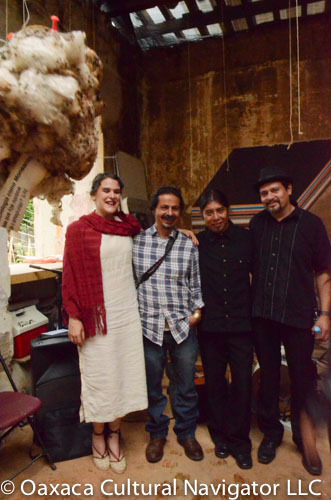 When Alejandro de Avila B. returned to Oaxaca after completing his PhD at University of California at Berkeley, he became the director of the Ethnobotanical Garden and then later, curator at the Museo Textil de Oaxaca. He continues to have an important impact on the development of arts and culture in the city and is an extraordinarily knowledgeable resource.